Sometimes I make thinks overly complicated. Take the following example: I purchased a 1000H netbook with the sole purpose of putting OS X 10.6 on it. After research and dinking around for several weeks, I successfully loaded OS X on the netbook. Then I decide it would be awesome to dual boot. Quickly that morphs into triple booting. So I spent the entire evening and all of my lunch break installing OS X, Windows 7, and Ubuntu - twice. Currently the only OSes I can get to boot are OS X (via USB stick boot loader) and Ubuntu (via grub). Still, I'm enjoying the challenge. I may even feel a little empty when this is working properly. This project has been in some form or another for over a month. 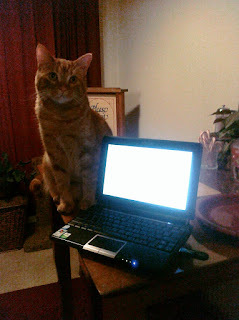 So here's Leki, guarding the netbook while it re-installs OS X 10.6. On a lighter note - there were tasty foods at work I nommed on while trying to tweak the netbook. Hooray for Craig's wife! 288/365 - What Did I Do Today? 286/365 - Tasty Treats Come With Decorating Tips? 284/365 - Tasty Quesadillas & Dragon Age! 271/365 - Toaster Strudels That Vomit?